Tashi has had a rough life. With the power of an inhabitor, someone who bonds with an animal, they have been trained as solider and a spy. 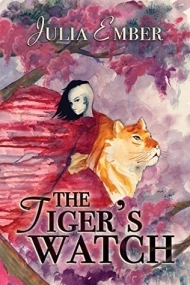 Fleeing a battle, Tashi seeks a hideout at a monastery, but when the enemy decides to use the monastery as a hospital, they are in more danger than ever. Xian, a commander in the enemy army, decides to use Tashi as a helper, putting them in a valuable but possibly deadly situation. And when Tashi sees Xian’s vulnerable side outside of his commanding company, allegiances, truth, and decisions are tested at every turn. Julia Ember’s THE TIGER’S WATCH is a thrilling fantasy with delightful, unforgettable characters. Tashi is both brave and vulnerable, sure in some areas but completely doubtful in others. Their bond with the tiger makes a touching companionship, and the scenes where Tashi’s inhabitor powers are used will leave your jaw dropping in amazement. The world of the inhabitors was my favorite part, full of bittersweet wonder and magic that leaves your heart aching. While the story begins and ends with fantastic action, there are a few stretches in the middle that have slower pacing and occasionally drags. However, this does offer a nice opportunity to explore more of Tashi’s internal life, and their narration is memorable and smooth. Ember writes scenes that could cause a fire with the romantic tension and moments where no backside is safe so far on the edge of the seat. Fans of Cindy Pon’s Serpentine will devour THE TIGER’S WATCH and eagerly await the preorder button for the sequel once they reach the cliffhanger ending.